Once upon a time we used to go to a fair few gigs. Music is just so much better being seen live, I reckon. So it's just so great when there are free outdoors concerts for the whole family to enjoy - like the bFM summer series we went to last Saturday. It was the first time they held it at Silo Park, and I think it was a perfect venue for it. I packed us a picnic and got there early afternoon with Kien while Jef finished up some chores at home. I was actually hoping Kien would fall asleep in the buggy during the walk in. We picked a spot to settle in for the afternoon. By about the 5th line up the place was looking more like a concert stadium (a really nice open-air one) and less like a picnic area. 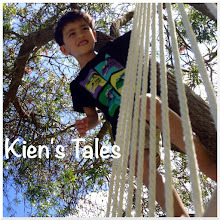 But when Kien was playing in the surrounding garden area it was like he was somewhere else entirely. He could also be found playing with pebbles. Or throwing them into the stream. As we walked home in the late afternoon through Victoria Park there were men in cricket whites out enjoying the sun. We stayed and watched them play until the game was over (and saw one guy bat 2 balls onto the motorway - luckily we didn't hear any thud and ensuing crash!). It was a fabulous day and not only a reminder of yesteryear but also what more we have to look forward to now that there is a little more flex as Kien gets older. What a lovely afternoon you had. I found with my 2 now that they are older going out and about is so much easier.